Nothing says Happy New Year quite like a good cocktail, or a nice piece of ice cream cake. At least that’s what we decided this year. After a week off from work, and we still had New Year’s to look forward to, things were looking good. We had ample time to really think hard about the dessert we would prepare. Normally I put that kind of thought into the cocktails that I make, but this year things were a little different. I really put together the cocktail list in a matter of minutes, but we spent hours going back and forth on the dessert. The dessert was really created around a centerpiece, and that was my grandmother’s chocolate sauce. My mother had made some when she was visiting, and we still had a lot left over. This is not your ordinary chocolate sauce either – I seriously could eat it with a spoon, it is so perfectly balanced. So, it was not crazy at all that we had to create a dessert in order to incorporate her sauce. Ice cream was of course the first thing we thought of – but it was New Year’s Eve – a special celebration – it had to be outrageous. I am not sure whose idea it was to create a brownie bottom, but we debated the brownie bottom vs. the chocolate chip cookie bottom for quite some time – at one point we even had both in the dessert – but we ended up settling for the brownie. Then it was time to choose the ice cream. Mint chocolate chip was the clear winner for a while, but I just couldn’t get past the fact that some people don’t like mint. Also – I thought that the richness of the brownie needed some type of vanilla in the ice cream. It wasn’t until we were at the store – after spending 15 minutes with multiple selections in our cart, that we ended up with chocolate chip cookie dough. We added a little whipped cream on top, and then poured the chocolate sauce all over. Wow. That is just about all I can say. Here’s to a New Year filled with health, happiness, delicious food and creative cocktails. What more could you want? Weigh or lightly spoon flour into dry measuring cups; level with a knife. Combine flour and next 5 ingredients (through salt) in a large bowl. Combine 1/2 cup chocolate and milk in a microwave-safe bowl; microwave at HIGH 1 minute, stirring after 30 seconds. Stir in butter, vanilla, and eggs. Add milk mixture and 1/2 cup chocolate; stir to combine. Pour the batter into a 9-inch square metal baking pan with a piece of parchment paper that over hangs on two of the sides – then butter the parchment. Bake at 350° for 19 minutes or until a wooden pick inserted in center comes out with moist crumbs clinging. Cool in the pan on a rack. When brownies are completely cool, let the ice cream sit on the counter until it is slightly softened (so it is spreadable). 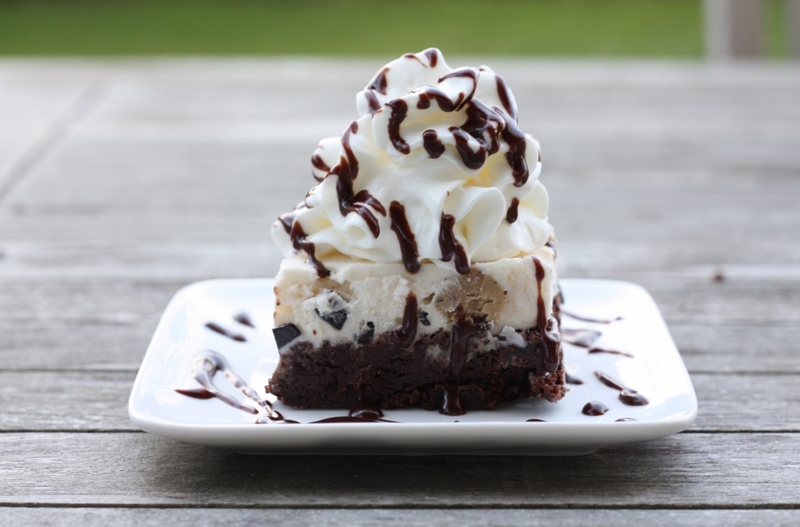 Spread the ice cream on top of the brownie in the pan. Cover with plastic wrap, and put back in the freezer until frozen solid. To make the fudge sauce, melt butter over medium heat. Add unsweetened chocolate & melt, stirring. Add cocoa, sugar, and milk and stir well to combine. Boil a few minutes, stirring. Turn off the heat then add vanilla and salt. Stir to combine. Keeps in refrigerator for a few weeks. Heat GENTLY in microwave to soften & serve. When you are ready to serve, you can lift on the parchment paper and place the entire cake on a cutting board and cut into 16 squares. Put some whipped cream on each piece, and top with warm chocolate sauce. Enjoy! Yum! My favorite thing (probably even more than a cocktail) is dessert. Love this. Wishing you an awesome start to 2015! If I had some of your grandmother’s special chocolate sauce whether that was over this delicious dessert or over my chocolate martini I would be one very happy person.